Encompassing approximately five city blocks from 9th Avenue SE to Riverfront Avenue along the Bow River, the 3rd Street SE Streetscape Improvement Project will dramatically reshape a space currently dominated by vehicles and LRT lines into a pedestrian-oriented streetscape that connects the New Central Library with Jack & Jean Leslie RiverWalk™ and the Bow River. Planning for the project began in 2015. With the goals of creating a cohesive visual identity and establishing complementary and engaging public spaces that give precedence to the pedestrian experience, CMLC selected PFS Studio in partnership with Marc Boutin Architectural Collaborative as prime design consultant. 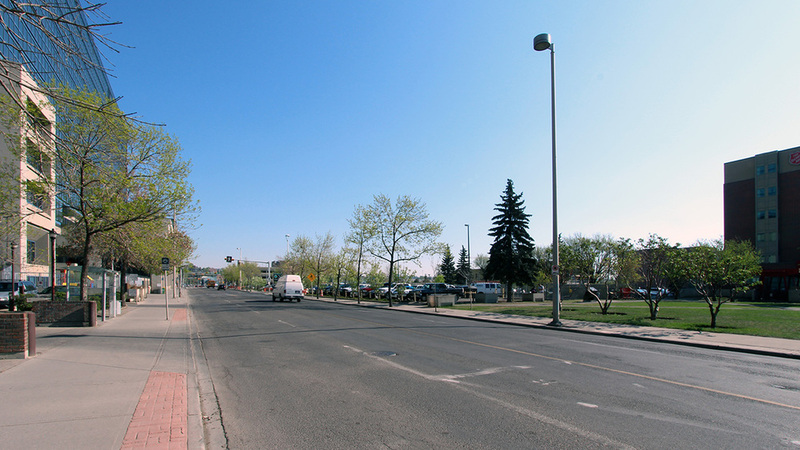 The design for the streetscape improvements has unfolded within the context of the vision of East Village which has a unique ‘cobblestone-like’ streetscape and an interconnected system of pedestrian dedicated pathways and streets. Throughout 2016, CMLC worked with the project team to advance the program, undertaking detailed design work during Q1 2016 and, in Q2, submitting engineering and landscape drawings for the southernmost three blocks (9th Avenue to 6th Avenue SE) to the City of Calgary for approvals. Construction of the 3rd Street SE public realm program is being delivered in two phases. Phase one, constitutes that area along 3rd Street SE between 9 Avenue and 5 Avenue. Phase two represents work being completed from 5 Avenue to Riverfront Avenue. Phase one of the project was completed in 2018.